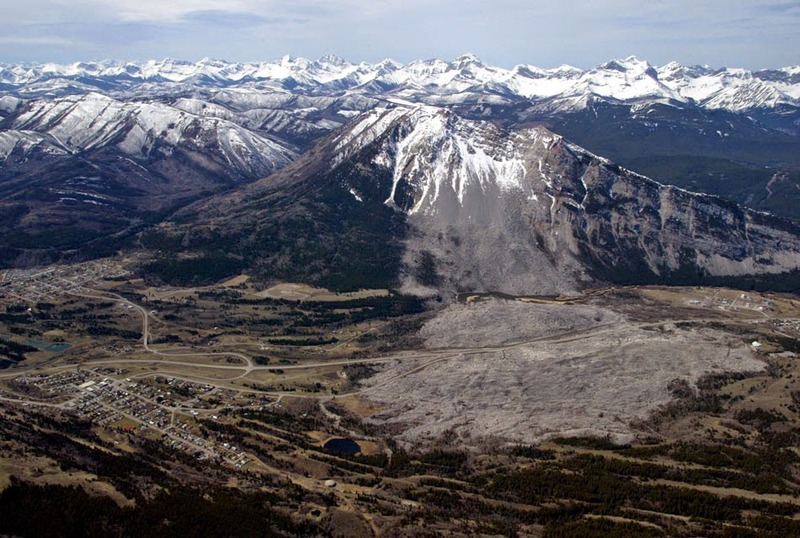 Not far from Calgary, Alberta, and just east of the Crowsnest Pass, lies the small, bustling town of Frank, Alberta, nestled on the floor of a deeply-glaciated valley. Looming menacingly nearby is Turtle Mountain. Also nearby is a scene of a destruction of such magnitude that it has never been equalled! 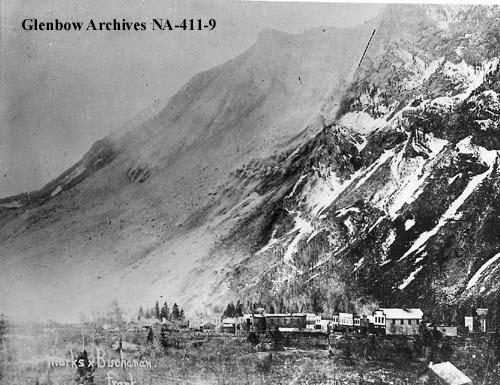 In the early morning hours of April 29, 1903, Turtle Mountain collapsed, resulting in the greatest landslide in North American history. 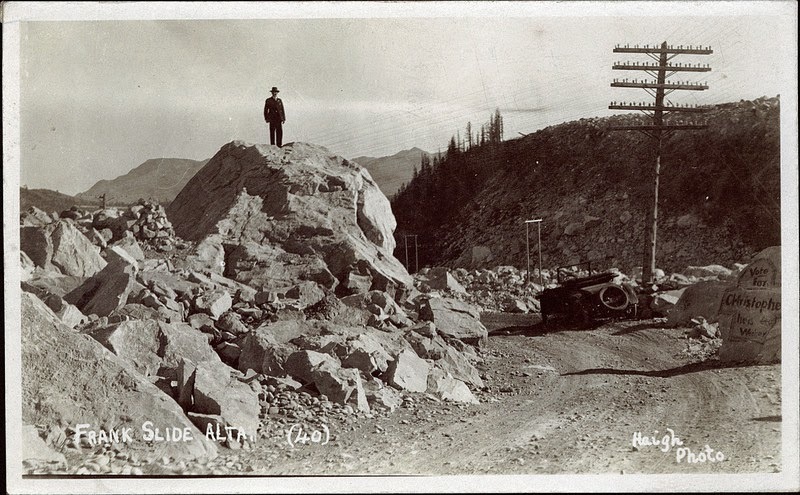 In 100 seconds: at least 76 people were buried alive under tons of massive limestone boulders; three-quarters of the homes in Frank were crushed like balsa wood; over a mile of the Canadian Pacific Railroad was completely destroyed; and a river became a lake. 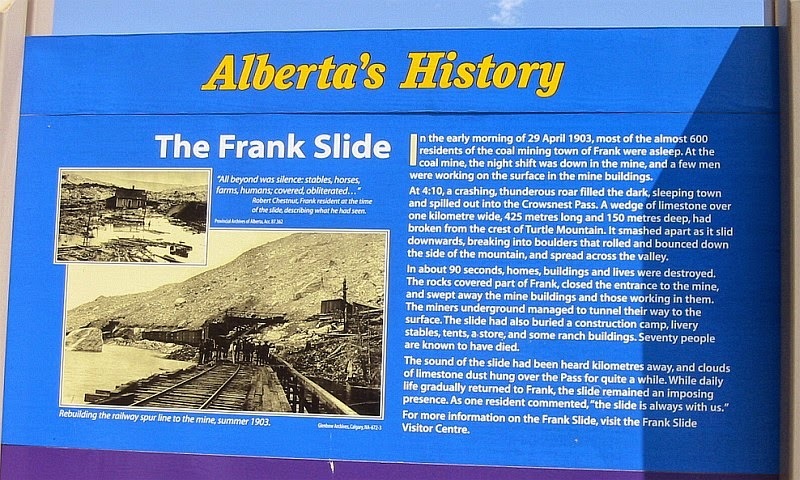 My parents were driving out to the coast and travelling through Frank Slide was a necessity. In the years after the tragedy, not much of the rubble had been disturbed. The giant boulders and pieces of mountain lay where they had fallen, a silent testament to those trapped forever beneath. The road had been cut through and the railway reconnected. Little else had been touched. Driving through, one's car dwarfed by the massive chunks of rock, one could easily imagine the horror and heartbreak of that fateful morning. One or the other of my parents would point out the eagerly anticipated animals. I would stare at them for as long as time permitted, then collapse back onto the seat with a sigh and return to whatever I had been doing. I was fairly easily entertained. The road had been long. We had already been travelling for an hour. I was drowsing on the back seat. The tone of voice was the same as what my parents used whenever they pointed out something interesting. But because the word 'horse' had not actually been used, I was slow to respond. I must admit that I never even heard my Mom's comment. I sat up and pressed my face against the window. I don't know what I was expecting. Dad had said something about a 'slide'. To me that meant something 'playground-y'. All I could see were huge rocks. What kind of playground was this? I don't think they ever figured out that I was talking about the 'slide'. The real slide. The one Dad had seen. All they wanted was to look at the stupid rocks. Labels: A child's perspective. Re-post. I scrunched up my face into my most impressive I’m-thinking-about-it form and . . . thought about it. So many options. So much to choose from. I opened my mouth, expecting something of import to emerge. Okay, I know what you’re thinking. Not the brightest bulb in the chandelier. I blinked and gulped and nodded. Maybe I could try . . . or . . . no . . . what I really wanted . . . Suddenly a brilliant suggestion presented itself. “Could I have a combination? A mixture?” I whispered hopefully. He shrugged. “Please keep in mind I’m not a wizard,” he said. He scratched his ear and glanced toward the window. Not a wizard? But I thought . . . I looked toward the window, too. The streetlights had come on and were casting pools of gold on a black street; shining bravely in a dark and moonless night. It appeared that a wind was starting to kick up. I could see bits of litter being blown around. I shivered and turned back. He dropped the spurtle (I finally remembered the name of it!) he had been fiddling with to the counter and punched some buttons in the cash register. “Fine. You’re order number 16.” He took the ten from me, efficiently made change and then nodded and looked past me. I stuffed my change into my purse and quickly shuffled to one side. Delores of Under the Porch Light comes up with a challenge once a week. A word challenge. One never knows what it will be, except that it will be fun! Tricky, tricky Delores. This is what I did with it. Go to Delores' and see what her other minions have created! Labels: You know you've been there. I've used many, many recipes in my life. Starting with simple: crackers and cheese. And, believe me, you have to get that one just right . . .
To more complicated: hot dogs. And I'm sure I don't have to explain the vital importance of the meat to bun ratio. And I won’t even go into the selection and/or serving size of condiments. But my very first recipe was not nutritious. In fact, though it smelled rather good, I wouldn't have fed it to the dog. Well, actually I did try. I was staying with my friend/cousin, Jean. We had been playing in Aunt Grace's kitchen. Under Aunt Grace's feet. Aunt Grace had finally had enough and had kicked us outside to play. Now we were looking for something a little more . . . constructive. 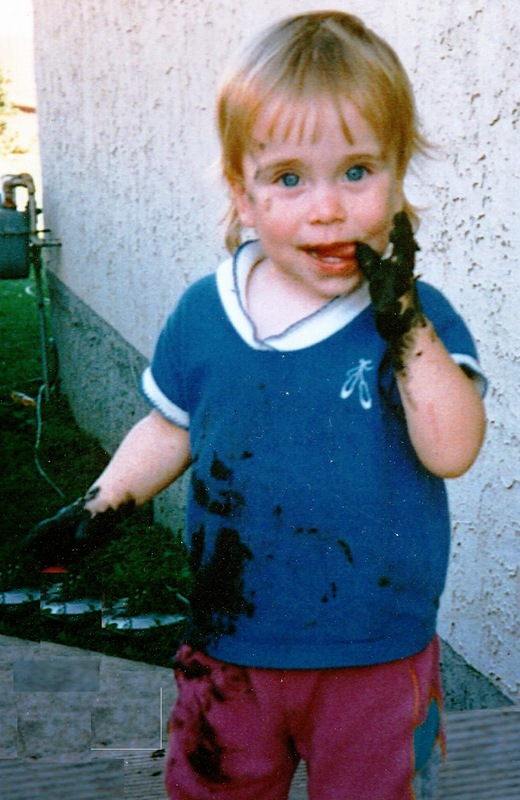 “Let’s make mud pies!” Jean suggested. She found an old pot and we started adding ingredients. I should mention here that, as we didn't have all of the ingredients for pie, and really weren't completely sure what those ingredients were, we . . . erm . . . substituted. Water. (For water) And I should tell you that you have to get this ingredient just right. Too much and your mud pies are sloppy. Not enough and you can’t do a thing with them. Just FYI. We didn't mix any awful things into it, though I did find some dog doo that I was tempted to add. Finally, we mixed our wondrous concoction and formed it carefully into little blobs on the wall of her mother’s flower garden. Right in the sunlight where our pies could cook and get nice and toasty. Mmmm. They even smelled good. I never got to taste our pies. We were called in to dinner and my Mom picked me up just after that. But I remember them. And how they would have tasted . . .
Last night, our good friend, Shirley was over visiting. And told us about her ‘mud pie’ story. She and her sister had found an old pail. Now they were ready for the ‘cooking’ part. But here, Shirley’s story takes a different turn from mine. When she was young, her family had a chicken coop. With a little wood stove inside to keep their feathered friends warm in the cooler months of the year. Why bother to set their mud concoction into the sun, where the actual ‘baking’ would be iffy, at best. They would set their creation on the little wood stove. No sooner said than . . . I probably don’t have to tell you that the flaws in their technique were almost immediately apparent. So, a note to all mud-pie enthusiasts out there. Labels: How do you take yours? Have I Reached the Party to Whom I'm Speaking? My Dad is the last surviving member of a family of thirteen, the youngest of eleven children. He has been reminiscing . . .
You dialled a number directly and paid. Or, if you weren't certain that the person you wanted was home, you could dial ‘person-to-person’ and have an operator facilitate the call. This was more expensive if your party was there, but cost you nothing if they weren't. My daughter says I should do something . . . important. But I don’t know anything important. You’re getting the old and usual . . .
As co-ordinator of my little group of four boys, I was entrusted with the bag ‘o treats. The feathers, popsicle sticks, foam sheets, paper cups, string, sticks, tape, glue and scores of other building materials. One of them asked for sticks and I dove into the mass of materials and dug out a small container of bundles of sticks. Colourful little bundles of sticks. Our teacher, Miss Woronoski had laid out multi-coloured sticks. Some singles. Some in bundles of five and ten. Labels: It's a personal thing. In honour of Family Day, I present . . . my family . . .
I’m sure it was a normal, every-year, run-of-the-mill holiday. Everywhere but at the Tolley home. My Husby and I have six children. Originally, we were going for a baseball team, but we ran out of steam somewhere around short stop. Sooo . . . six kids. Ages five to seventeen. It was Christmas time and we had to do something with them. Hmmm . . .What if we put them all on the stage? 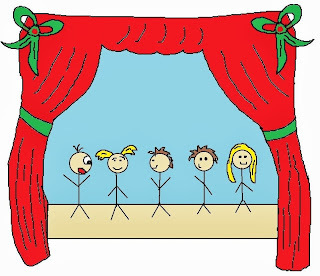 Had our own theatre company? Well, it made sense to us. For that one magical Christmas, we had just that. The Tolley Troubadours. 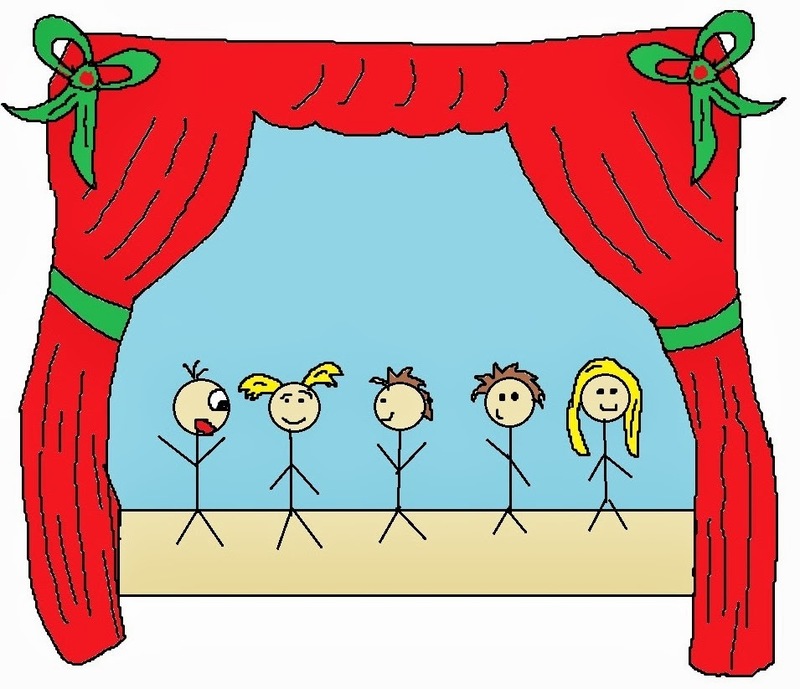 Specializing in Dinner Theatre Who-done-its. Our most famous play? The Demise of Santa Claus. Okay, Broadway, we weren’t. But we sure had fun. The Grinch. Our Seventeen-year-old. Self-proclaimed hater of Santa Claus and everything he stood for. And possessor of many and varied instruments of death and destruction whose sole purpose was the final end of the aforementioned and hapless Claus. Alfie the Elf. Our thirteen-year-old. Mobile-mouthed purveyor of all things ‘cookie’. Not averse to a little bribery when the mood took him. Mrs. Claus. Our eleven-year-old. Heavily made up, padded and hunched over model of sweetness and light. Until someone questioned her honesty. Then watch the rolling pin come out. Angel Sweetface. Our eight-year-old. Wealthy, angelic example of life lived well. A little too well. Heaven forbid that anything should interfere with her rather skewed view of the world. Elfie the Elf. Our five-year-old. Son of Alfie. And mute. Until moments of stress/surprise/revelation when he became remarkably conversant and effusive. Strange. Inspector Clueso. My Husby. Bumbling, inept investigator of all things mysterious. Namely every person on the playbill. Bambi. Me. Feather-brained mistress of ceremonies. Woefully type-cast. And there it is. The line up. Before, during and after a good dinner, based on the clues gleaned from presented scenes, the guests had to figure out who ‘done it’. Surprisingly, they were right. Just not right enough. It was hard to figure out who had the most fun. Yep. The best of holidays. P.S. Looking for some unique entertainment for your celebrations? Not too particular about quality and/or expertise? I have someone I can recommend . . .